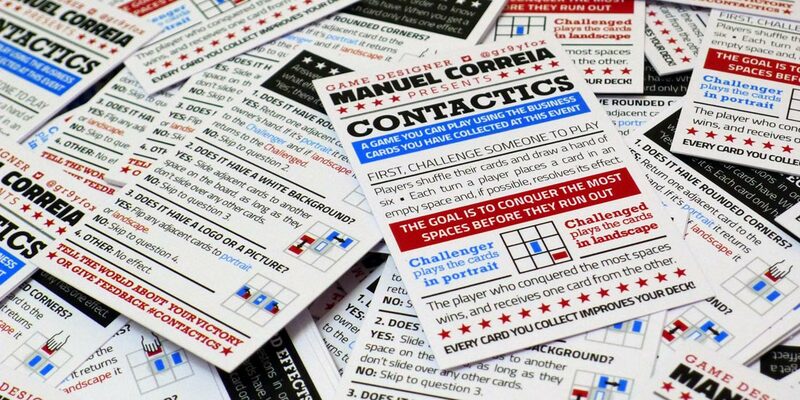 Contactics is a game which fits a business card. It was designed to be distributed at gaming and networking events, when everyone is handing out business cards left and right. In Contactics you shuffle all the cards you collected so far and use them as a deck. It is a two player area control game, where you’re trying to conquer the most spaces on a 3×3 grid. Every turn you play a card in a space, and its special power activates. A series of questions on the back of the Contactics card let you know which types of cards do which. That way you can plan out your decks by selecting which cards you carry around with you. If you win, the other player gives you a card! Soon enough one of the organizers of the Canada Photo Convention spotted the game online and asked for it to be present in the 2014 edition. It was handed out to every visitor as part of the welcome goodie bag, had custom tables with grids and even held a tournament with prizes! You can get the print-ready files here.